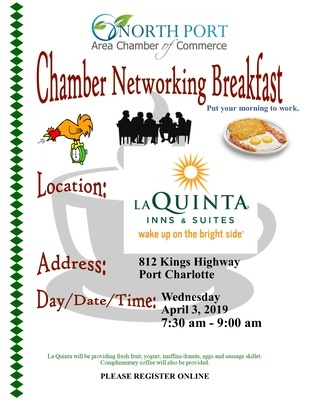 The Breakfast Club is a structured networking event, which simply means that everyone in the room will be allotted time to talk about their business, product, or service. There may be a guest speaker. If no guest speaker, a Chamber Champions may have the chance to present a 5-minute spotlight on their business. Remember to bring a gift for the drawing to promote your business. There is no cost to attend. LaQuinta will be providing a small breakfast of fresh fruit, yogurt, muffins/donuts, eggs and sausage skillet. Complimentary coffee will also be provided.